Bethnal Green is an area full to the brim of excellent design and social haunts (as we checked out previously) and the Pill Box itself is a fantastic example of a considered, converted Victorian factory now home to a hive of creators. The space has great bones, an exposed brick wall, lovely windows & light, very good coffee & wifi! As we like to practice what we preach, we needed to make the studio our own. Our strategy was exactly the same as we apply to own clients, to make work life better. For us, that means creating a space that’s largely agile, inspiring, has a breakout area, has greenery, character, feels right for ‘us’ and of course, cost effective. And yes this is possible in almost any space! We saved money by spending wisely, opting to pimp up IKEA desks and old vintage stools we had stored and making key purchases that added character like our vintage haberdashery unit to house all our amazing samples. A layout table for design collaboration was also essential along with an ‘ideas’ wall. We were careful to maximise the space as much possible, so items such as a kitchen island were really important, giving us a small breakout space plus storage. And of course, for anyone who knows us, it had to have greenery! We haven’t finished adorning our surfaces with plants yet, but we’ve made pretty good inroads and wow does it made the biggest difference. Our vintage mid century desk planter and even our ceiling are adorned with our flora and fauna friends and we think this MAKES our space. Whilst we are still searching for the perfect items to finish the space, these few touches that we’ve added really make the difference to the way we feel and work. We've kept it really agile too, as a growing small business we wanted to be able to take everything with us when we upscale. 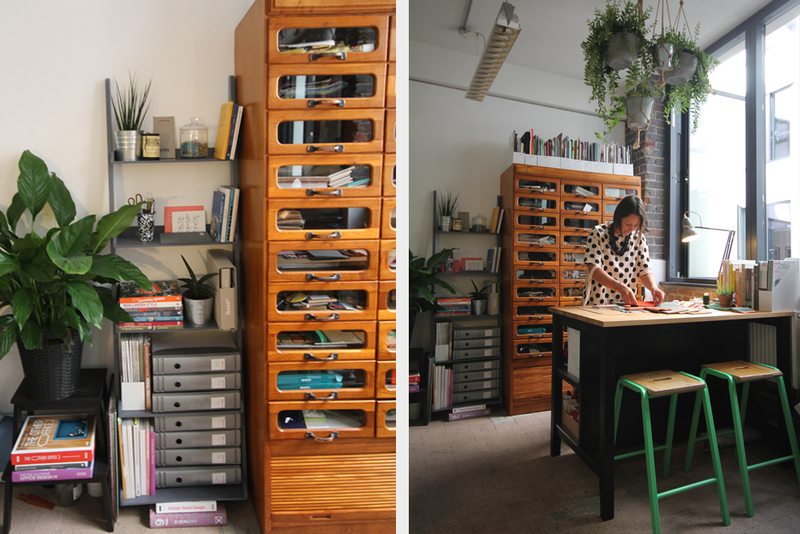 The flexibility at the Pillbox, run by workspace group, allows us to upscale to a bigger studio when we need to. As our own clients, we can definitely say we’ve made work life better!